Machine learning and mind-blowing creativity at this year’s Meet Up. Deuchler, detailed some of the most exciting news from Adobe MAX, Adobe’s annual creativity conference. Some inspirational speakers then took to the stage to share their best tips and tricks for making it in the creative industry. Headlined by Nick Knight OBE - one of the world’s most exciting photographers - the event also saw the likes of trailblazing art director Kate Moross and talented print designer Kelly Anna fire up the crowd as they walked through their ground-breaking projects. Couldn't make it? Fear not, as you can see what happened at the Meet Up right here. There was so much to learn from this fantastic evening of creative insights. Here are our top picks from Adobe’s 2017 London Creative Meet Up – and if watching this inspires you to get creative, make sure try a free trial of Creative Cloud over on the Adobe website. Every one of the new features and updates announced at Adobe MAX are powered by Sensei, Adobe’s incredible artificial intelligence and machine learning platform. Addressing the issue of ‘content velocity’ – the industry’s ever-increasing need for more content – Sensei helps designers and creatives go from concept to completion much faster, using the power of advanced technology and deep learning to accelerate the creative process. “Sensei represents the blending of art and science in our DNA,” Deuchler told the audience in London. One thing’s for sure: this is the future of the creative industry - and we’ll be seeing a lot more of it soon. Adobe’s revolutionary tool for UI and UX designers is now out of beta - and quite frankly, it'll change your life if you design websites or apps. Letting you easily prototype and wireframe your projects on interactive artboards, Adobe XD is an all-in-one cross-platform solution that delivers the speed, precision and quality you need to go from static comps or wireframes to fully interactive prototypes in minutes. Lightroom CC, Adobe’s all-new cloud-centric photo service, lets users edit, organise, store and share photos from anywhere. One of its most impressive features – powered by Sensei – automatically applies searchable keywords to your images, without you even having to tag them. So, if you're looking for a brilliant old photo of your dog that you didn’t bother tagging, or a particular shot from a shoot that you didn’t tag, don't worry. Simply type in your keywords and Sensei will find it. Amazing. Adobe LIVE is a live-streaming channel where Behance community members can learn from and inspire each other. “Adobe streams eight hours of creative learning content every day, Tuesday to Thursday,” said Deuchler – and this is pegged to expand to 24/7 programming in 2018. “Everything else you can catch up on later,” explained Kate Moross. She was talking about working for yourself – and explained how this is exactly how she started out in the industry. With clients including Nike, One Direction, Vogue and more - and a host of awards to her name – it’s fair to say the Studio Moross founder seems to know what she’s talking about. "Being naive gives you advantages, and means you haven’t been affected by trends,” said Moross, who also encouraged the audience to “make ugly stuff”. She explained that by taking time to explore less visibly attractive aesthetics, it’s possible to break down the trends we can find ourselves surrounded by every day – and unleash our true creativity. Legendary creative Nick Knight provided a fascinating insight into his ongoing debate about photography and image-making. “I take pictures on my phone, broadcast them globally, instantly... I can make them into a 3D sculpture if I want. Let's free ourselves from this idea that we're photographers,” he urged. If we had to pick one takeaway from Nick’s talk, it would be the importance - and value – of taking a DIY approach to creativity. Thanks to the internet, we don’t need a middleman like a magazine to sell our images or get our names out there anymore. “It feels like we can do it ourselves,” he said. Inspired? 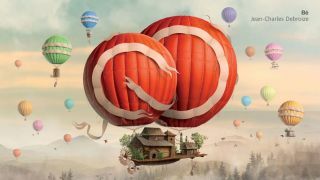 Head over to the Adobe website to download a free trial of Creative Cloud – and start creating right now.